Dubai, UAE, November 7, 2016: On Friday, Dr. Mahareiq Group opened the second branch of Strokerz Middle East in Dubai Investment Park, Dubai. The event was attended by VIPs, motorcycles fans, and riders from Jordan, Saudi Arabia, Kuwait, Bahrain, Oman, and Lebanon. Strokerz Middle East-Dubai will be the first specialized company that provides maintenance and customization services according to best international standards. 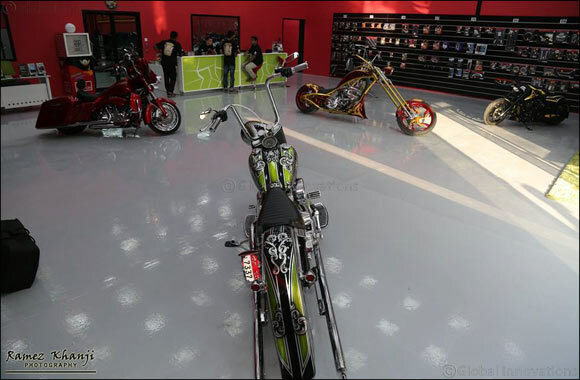 It is also the biggest GCC company as per the area of the workshop and number of bikes it can accommodate. This new branch translates the commitment of Mahariq Group to realize the vision of Dr. Mohammad Hisham, Group Founder, to promote the comprehensive motorbikes services in the UAE to the highest levels by 2020, and to produce full bikes in the UAE to embody the slogan of Dubai Expo 2020 in industrial development. On this occasion, Dr. Muhammad Hisham expressed his excitement for introducing Strokerz to Dubai after four years since the brand first opened its stores in Abu Duabi. He asserted that this major achievement could not be realized without the un-seizing support from the wise leadership in providing great facilities that create suitable environment for innovation in this popular industry. Mahareiq Group is a local group with international operations that provides comprehensive services to the wider bikers’ community. The Group provides comprehensive services that translate its vision and vision regarding the bikers’ community which the company believes it holds many noble and human messages. Mahareiq Group has a portfolio of companies, including Dream Roads, for travel and tourism services for bikers in the UAE and abroad. The company provides comprehensive tourism services for bikers, including flight bookings, obtaining bikes in the destination, providing accommodation, as well as exclusive services from Master Chef and Mister Falafel restaurants. The Group portfolio also includes Delta Production that is producing the first Arab film about bikers’ life and bikes production.